SOOOO, It Must Be Spring!! Looks like a mess, but I’m into that Messy Mood. Using a Large Manila (8 inches) tag, I did a TH thing with DI on my resist sheet, alittle H2o and dragged the poor little tag all over it. 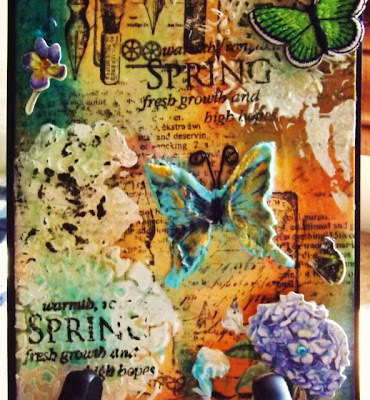 Sponged on some more DI’s, Stamped some images, then smeared on Gesso, which I cut a Spellbinders die and pressed it into the wet Gesso. 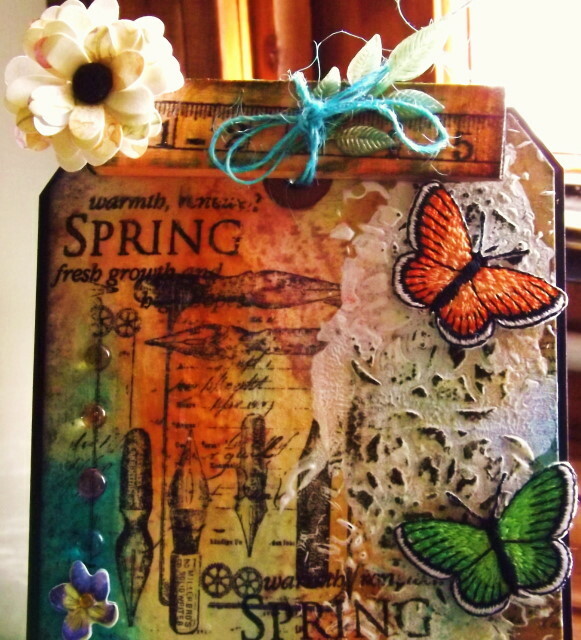 Then I used embossing paste and another die cut for the butterfly. Just before it dried I stamped a butterfly image into the wet embossing paste. Added some Gold paint to the wings. Boy it feels so good to get messy again. Hope you enjoy the tag, thanks for stopping in today. 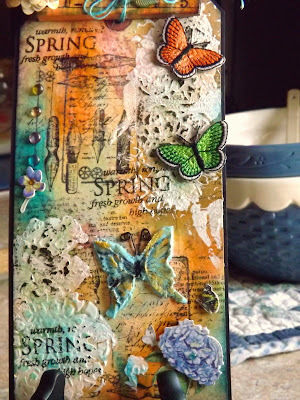 Well I love messy, and I love this Tag, it is full of texture and colour and the beginning of life, just beautiful, you should get messy more often!!! Gorgeous tag- miss you at TJ!!! OMGosh! Vada this is a beautiful tag! Love all the detail and texture you accomplished! OH my GF is back and looking BEAUTIFUL! 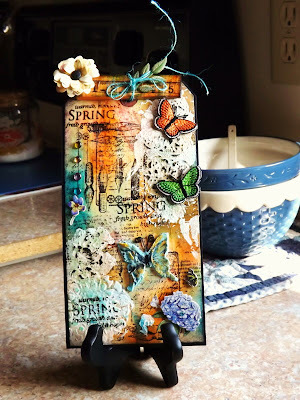 Vada, I just love your mess and all the texture on this tag! The butterflies and colors are bursting with Spring! Hope it stays there for you! Hugs! How beautiful, Vada! Nothing you do is ever messy! Isn't it just fun to go a little crazy now and then, Kind of like being a kid again!! Love your tag and all the creative things you did. It's beautiful.